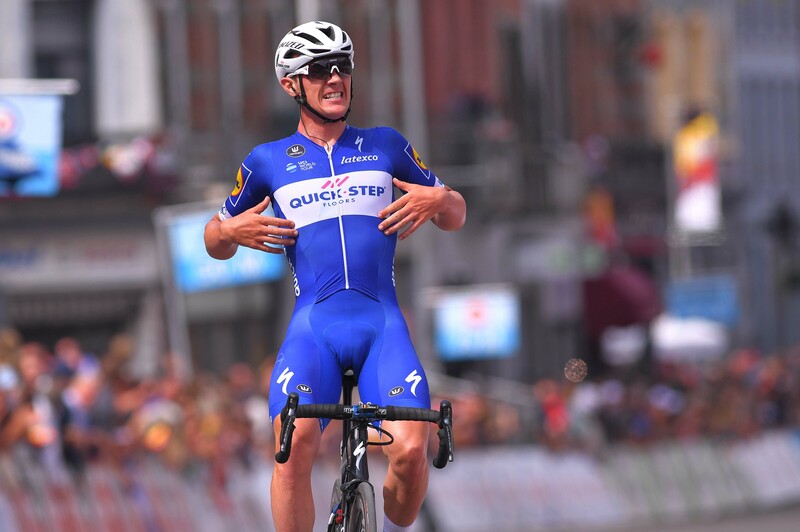 Quick-Step Floors produced another masterpiece and show of strength, claiming 1-2 in Binche after a frantic and spectacular race. 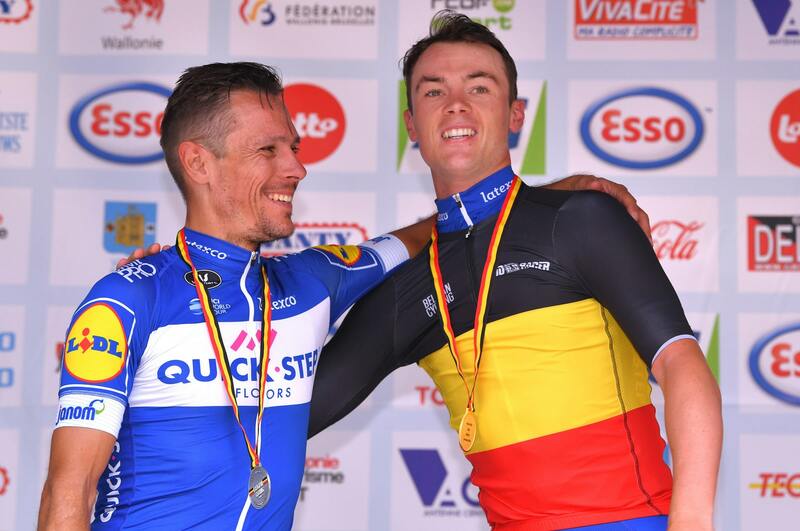 Yves Lampaert will wear the beautiful and famous Belgian tricolor for the next 12 months, after soloing to one of the biggest victories of his career on Sunday afternoon. The Dwars door Vlaanderen champion was one of the most active riders from the start of the 223.6km race which took place in Binche, on an undulating 17.6km circuit which contained four pavé sectors and a 500m cobbled climb inside the last kilometer, making for one of the most memorable editions in recent history. It’s surreal, I can’t believe it! “I feel so amazingly happy, it’s such an incredible feeling, but I’ll need some time to let things sink in. I am so proud of this team! We showed again how strong we are as a Wolfpack. We ride together, always for each other, and it’s unbelievable to be part of this unique team”, an ecstatic Yves said before collecting his jersey and gold medal for his majestic triumph. The race got off to a fast and nervous start, which prevented any breakaway from forming in the first 60 kilometers. When a move managed to take shape, Quick-Step Floors made sure it was represented there by Dries Devenyns, who made his return to competition less than two weeks ago. That group was joined by a handful of riders who pushed strong from behind, including Yves Lampaert, third just a few days ago in the individual time trial. With many dangerous riders in that move, the peloton kept a close eye on the gap, which didn’t swell over two minutes at any point, and helped also by some frictions between the escapees, they clawed them back with around 20 kilometers to go, when a new race was preparing to start. On the final lap, Quick-Step Floors took again the initiative, attacking with the amazing duo of Philippe Gilbert and Yves Lampaert, who saw two men latch onto their wheel, as they carved out a nice advantage. A counterattack group joined the quartet with 12 kilometers to go, just as Gilbert put in a probing attack to which only Sep Vanmarcke (EF Education First) could initially respond. 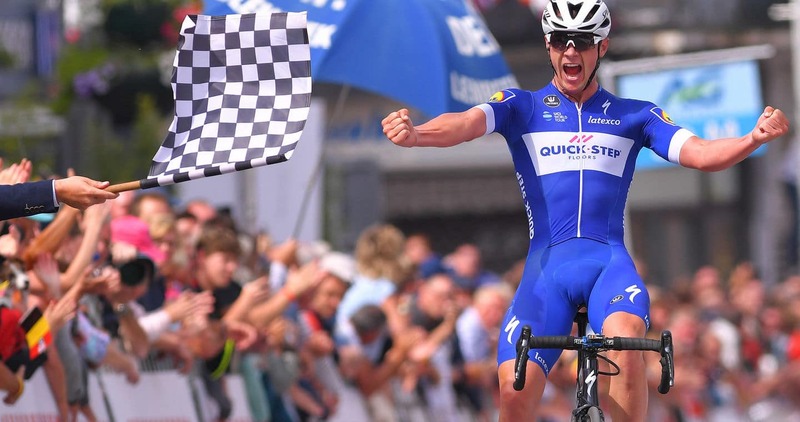 The chasers, among who was also Pieter Serry, linked up with the duo, but a searing acceleration of the two-time Belgian Champion sparked a new move, which included Yves Lampaert and Jasper Stuyven (Trek-Segafredo). The three used the Binche cobbles and tight corners to expand their slim margin, before Yves took off inside the last kilometers. The 27-year-old didn’t waste any time in forging a 20-second advantage, which he carried all the way to the finish line, where he prompted loud applause from the thousands of fans who witnessed a victory which makes Lampaert only the third rider in history to have won both the road race and ITT national titles. Philippe Gilbert ended runner-up after dropping Stuyven with one kilometer to go, for his seventh top-3 finish here, while Pieter Serry, who put in a ton of work during the race together with Laurens De Plus and Tim Declercq, concluded in fourth place, his best result in eight outings at the National Championships.